The flow of ambulances carrying victims into the Hennepin County Medical Center slowed by late in the evening. Director of Emergency Medicine Dr. Joseph Clinton says the hospital had treated 28 people with injuries and one patient who died. Six of those injured were in critical condition. Some had undergone surgery. Most of the victims bore signs of blunt trauma. "Typical blunt type injuries from motor vehicle trauma or fall, which means injuries to the head and face and extremities," said Clinton. "The problem with these type of injuries is you don't the extent of the internal injuries and that's what we're determining right now." Hospital officials were not able to release any further information on the victims. Outside the hospital, people seeking information about their loved ones appeared alone or in small groups looking dazed and worried. Michelle West was on her way to meet her sister's family when she heard news of the disaster. They were on their way to celebrate the high school graduations of a niece and nephew when her sister's car got caught up in the bridge collapse. Her sister was still missing. "My two nieces are here and my brother-in-law is at a hospital at North Memorial in Robbinsdale and we can't find my sister," she said. "I'm just like frazzled I just can't believe it. I feel like I'm a dream or something." West was desperate for information about her sister, but in the meantime was going to visit her nieces. Twin Cities hospitals set up triage locations on either side of the I-35W bridge site. Triage staff sorted patients based on the severity of their injuries and their proximity to hospitals. 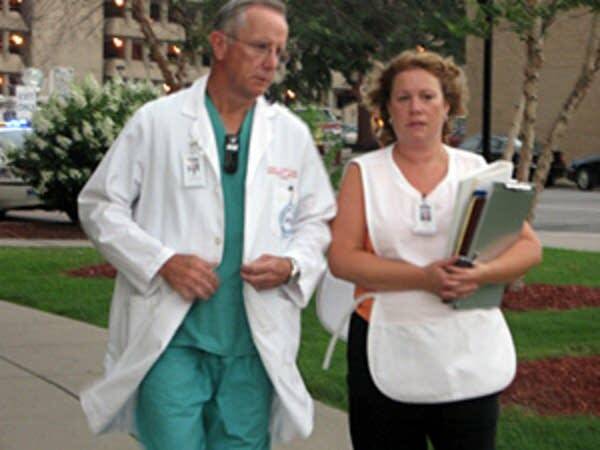 On the south side of the bridge, the most critical patients were sent to Hennepin County Medical Center. Those on the north were sent to a number of hospitals, including Fairview-University Medical Center. Officials say they had adequate staff and were satisfied with how the emergency response was handled. As news of the bridge collapse reached Hennepin County Medical Center, hospital staff asked patients who could wait to see a doctor to return later for treatment to make room for accident victims. Marcus, from Robbinsdale, came to the hospital late Wednesday searching for his roommate, Nicholas. 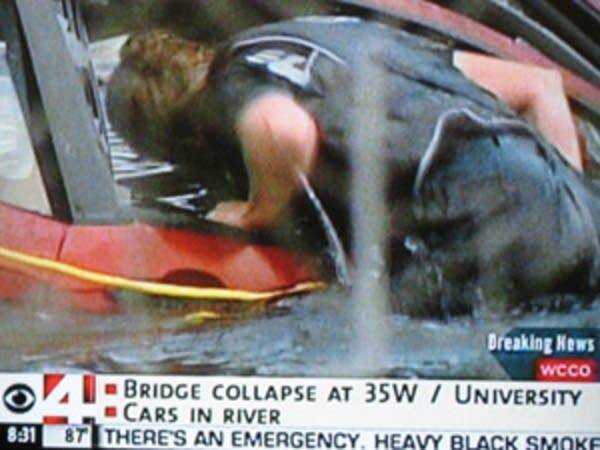 He was traveling on I-35W at around the time of the bridge collapsed. Marcus was unable to reach him by cellphone or pager. "I came down here to find out what's going on so I just got here. I'm still trying, I'm still trying to call him right now," said Marcus. The hospital was not yet able to find any record of Marcus' roommate. The roommate was also traveling with his son and his sister when the bridge collapsed. None of them answered their phones. And so he was waiting. "They are nowhere to be found," Marcus said. "My only family I have here is them, really it's very scary. So it's very scary I just hope and pray he's OK."
Area hospitals may have seen the last of the injured survivors. Rescue teams said most of the injured were brought in within an hour of the collapse. Minneapolis Fire Chief Jim Clack says fire department and other recovery crews are working hard to ensure the safety of rescue personnel. Clack says they'll have to work slowly to get into underwater spaces looking for submerged vehicles and victims.